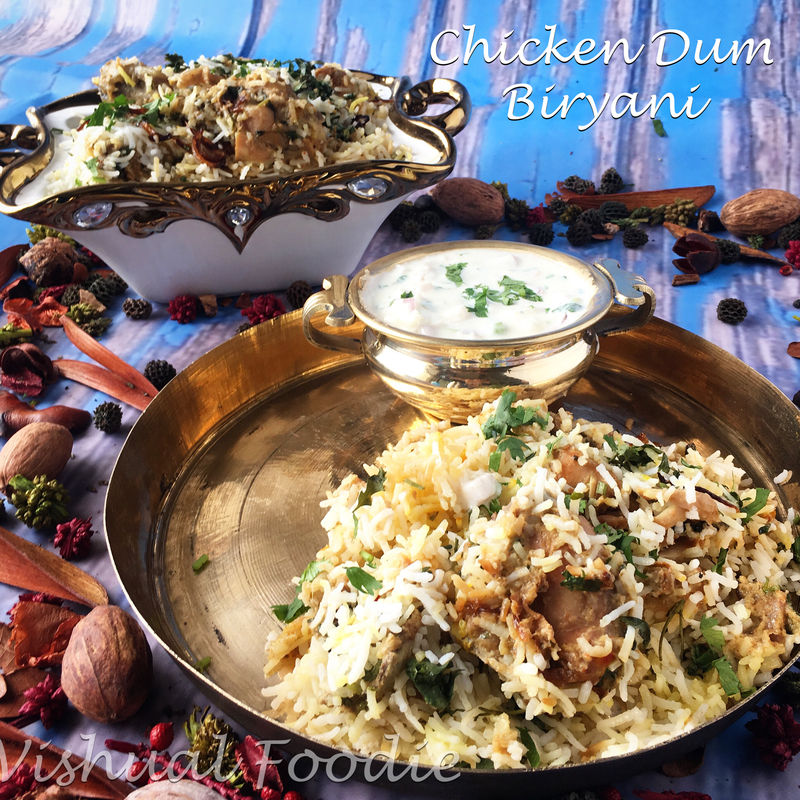 Eid is the one occasion where the aromas and flavours of Biryani call out to me. I love a good mutton biryani and was really keen to make the one I has posted in my blog a while back but the kids vetoed my brilliant plan and insisted on a chicken biryani. Now I had never made a chicken biryani so started checking recipes and asked a few friends too. Fatema Talwala came to my rescue and gave me an awesome recipe that I am sharing here. 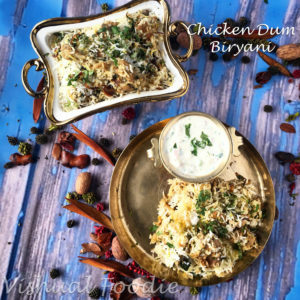 I followed her recipe blindly as I know her non vegetarian food is finger licking good. It has just the right amount of masala and spice and its full of flavour without being too rich. My guests loved it so much that they took little doggy bags home. Marinate the chicken with ginger, garlic, green chillies paste, salt, coriander powder, curd for half an hour. Cook the rice with some ghee, salt and a few whole garam masalas till 90% done. Spread on a plate to cool, Fluff the rice. In a pan, take pure ghee add cumin seeds. When they splutter, add Shah jeera, crackle whole garam masala, add chopped garlic, ginger, green chillies, curry leaves and saute till fragrant. Now add the onion past. Saute till the onions turn brown. Add the marinated chicken, mix well and cover and cook till the chicken is almost done. Add some fresh cream, garam masala powder and half of the chopped coriander and chopped mint. Add pieces of fried potatoes, see to it that chicken gravy is thick. Smoke this masala by heating a piece of coal till red. Put the coal in a small steel bowl and pour ghee on it. When it smokes, put the container in the chicken vessel and cover with a lid. The smoke will spread in teh vessel giving a lovely flavour to the chicken. Grease a vessel, make a layer of rice add kesar soaked in milk. If you want, you can add some food colour too dissolved in water. Spread the chicken, now add crushed birista (browned onion), add chopped coriander, mint leaves, pour some hot ghee. Spread another layer of rice, again pour Kesar soaked in milk and some food colour soaked in water. 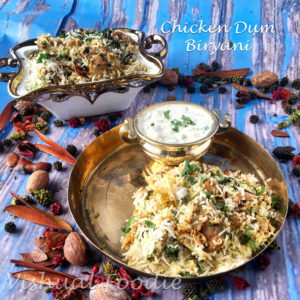 Sprinkle some water, coat the rim of vessel with wheat dough and place a lid, cook on dum till biryani is done about 20 mins.